Whananaki to Jaggers camp. Everything from rainforest to beaches, hills, sun, rain. ​Day 12. Whananaki – Ngurunguru / Nikau bay Camp. 26km. Total 338km. After yesterday’s crazy long hike, I am of course tired today! The night in the small hut was so nice and dry but I think I even sleep better in my tent now. As always I start at 7am. We have about 26km to go until Ngurunguru where we need to take a boat to cross the estuary. I (yes indeed, I did!) called James yesterday to enquire and either he or a certain Linda (the first woman to do the Te Araroa) can help us get across. Just as I start to hike it’s beginning to rain. First highlight today, the longest footbridge in the Southern hemisphere! It’s a nice wooden bridge and I meet children walking to school. Then it’s a beautiful coastal walk with great views on mainly private beaches. I am just not fully awake and struggle to walk, so I take my time today. After the rather easy coastal walk that took me more than three hours, it’s a short hike on the road before moving into the next forest section. I am tired and hungry but it’s so rainy that it’s hard to stop. For the first time since my start I am longing for a vanilla latte in a warm nice place. But instead I hike into a pine forest and find a rather sheltered place to enjoy my lunch (bread and cheese) already at 11.15am. Jess and Brad are passing by. A few more hours in the rainforest, it’s so peaceful but I really struggle to hike uphill as I feel so tired. Everything starts to be wet and as I come out of the forest for a 3km road hike it’s pouring. In Ngurunguru I buy two bananas at the supermarket and have a smoked fish pie in the nice Salt Air cafe. The others are enjoying yummy cakes and fries and we try to get a little dry. At 3pm I ring James but he can’t get us right now so we should hike to Linda – who already texted me instructions. We hike to her house where she installed an amazing trail magic microwave with lots of stuff for hikers. I take two single serve coffee bags, just what I was craving today. We are invited inside by Jim, Linda’s husband, who makes tea and coffee for everyone. It’s so lovely to sit and talk. James comes to pick us up for the short ride to his place. It’s wonderful, a nice garden and wooden kitchen, huge outdoor showers,…. The sun is out again and the others go for sea kayaking while I have another tea before preparing the next section and having dinner. Such a nice day in the end and incredible how nice these people are! Not sure who would offer for free trail magic and tea and a comfortable couch to random hikers in Germany. There is even a trail marker for the boat station! Day 13. Nikau Camp – Jaggers camp. 41km. Total 379km. Today I have to beat the tide so I am up at 5am and after getting a hug from wonderful James, I leave for my first 8km of roadwalking. But it’s a gravel road with very few cars and I enjoy the sunrise and morning mist. Then it’s again adventurous, 4km through the Mackerel forest with two river crossings. Nothing too difficult yet, the water is just knee high at its highest point. The forest is all damp and my feet are completely soaked. As I take a short break, Jess and Brad are getting ahead of me. Then 15km of road walking, it’s dull and hard on my feet but I am committed to hiking every bit of the trail while I have already seen and heard that others hitchhike the roads. Everything comes eventually to an end, it’s around 11.30am when I finally arrive at the Patua footbridge. The lowest tide should be at 11.54am so I think I am alright on my timing for the estuary crossing. But just as I walk towards the picnic tables, a man on a bike approaches me and tells me I have to continue hiking as the tide will come in quickly. He explains how to walk and offers me some food (so nice but I already have enough dehydrated food, fruits or vegetables I would have taken!). So no break after all, I continue almost running on the road until the beach entry. Jess and Brad are ahead waiting for me as we hike right on the beach through the mangroves. My feet keep on getting stuck in the mud (I remember that from somewhere!) but somehow it’s pretty cool. It takes a while to get to a trail marker in the middle of nowhere where the river can be crossed best. It’s not too deep again but all muddy we get finally out to farmland on the other side. A little fight with the cows and the electric fence later we are on a road again. A small parking 1.5km further is mentioned in the trail notes and we picture it as a nice place with toilets where we can clean ourselves from the mud. It’s hard to hike uphill as I am very hungry and this small road doesn’t look as if there will be any toilets. Indeed, there is nothing at all bit cows who gaze at me while I am having my toast and cheese lunch. Quinn and Matt join us and we decide to continue a few more kilometers to a camp. It’s hard to continue as my feet hurt plus it’s going uphill for half an hour before reaching the top of a hill with great views! The its all down again and on the road until I get finally to the beach where I can walk barefoot, what a relief for my feet! 3km further we hike up the dunes to the Jagger camp. It’s actually a private area where a few people have set up some cabines and infrastructure for their friends and family. They have decided to open it up to TA hikers on a donations basis as explains a man who is working there. It’s a nice place to stay! Stretching, setting up my camp, relaxing in a hanging chair before cooking dinner (glassnoodles, peas, seadood soup all in one) and going in my tent at 6.30pm. I am so tired and it feels good to lay down and just write my blog before hopefully sleeping well soon! 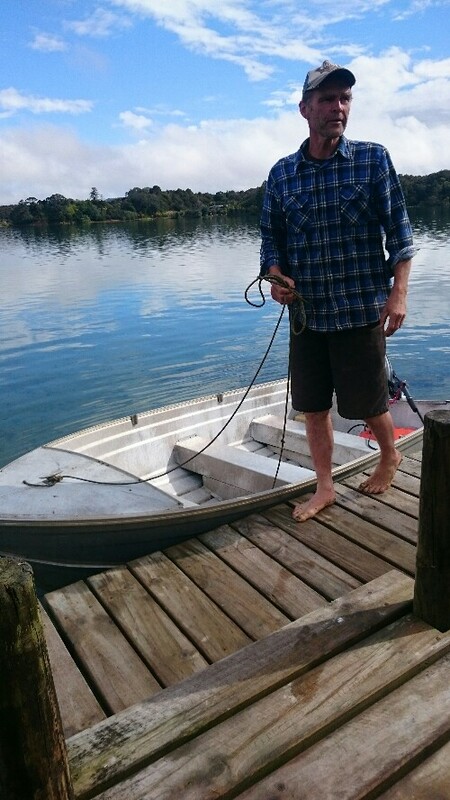 Previous Post Opua to Whananaki. Beautiful rainforest plus long road walking. Next Post Jaggers camp to Manghawai. Finishing the first section, Northland.